The initial week at the U.S. Open is complete and the men’s field has been scaled down to sixteen players. Two names missing from the roll call are Andy Roddick and Andy Murray. These two touted favorites were upset early on. Here’s a summary of the past seven days and an analysis of what could unfold the next few rounds. While Rafael Nadal barely passed his pre-tournament exams in Toronto and Cincinnati, in his first three matches at the Open, the Spaniard gets an A plus. Despite being tested, with a beefed up first serve to the tune of 130 miles per hour at times, Nadal has dispatched each adversary in three sets. In the fourth round, Nadal will face compatriot Feliciano Lopez. With Nadal’s 5-2 record against his fellow citizen, Lopez is likely the subsequent sacrificial lamb. After surviving a five set tussle in the first round against Fabio Fognini ranked 86th, Fernando Verdasco is in the round of 16 and will take on David Ferrer, the tenth seed. Although Verdasco has a 6-4 edge in their encounters, Ferrer prevailed at their last meeting on clay and at their only battle on hardcourt in 2004. David Nalbandian, one of the few players who could have troubled Nadal, was easily given his marching orders by Verdasco in the third round. Also in the top section of the draw, seventh seed Tomas Berdych was surprised in the first round by Michael Llodra. However, the jaw dropper came today with Murray, the 2008 finalist and fourth seed, dismissed by Stanislas Wawrinka in the third round. The Swiss advanced for the third occasion to the fourth round in New York. Wawrinka will meet Sam Querrey for a spot in the quarterfinals. Consequently, for Querrey, this is the ideal scenario to book his maiden quarterfinal berth at a major. The Spaniards have ruled and Tommy Robredo made sure to partake in the round of 16 festivities. With John Isner beaten by Mikhail Youzhny in the third round, Robredo and the Russian will fight for a place in the quarterfinals. Another American propelled into the limelight this week was eighteen year old Ryan Harrison. After coming through three rounds of qualifying, Harrison stunned Ivan Ljubicic, the fifteenth seed, in the first round. Furthermore, Harrison was one point from a win in a fifth set tiebreaker in the second round. Harrison became the first American teen to vanquish a top twenty player at a major since Roddick in 2001 also at this event. 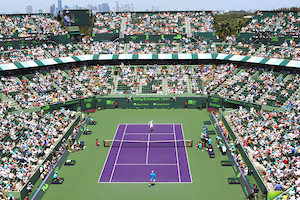 At the Sony Ericsson Open today, the women finalists will be determined along with the semifinalists for the top half of the men’s draw. For the third time, Venus Williams takes on Marion Bartoli. Their head to head stands at one all. Williams carried their 2007 Wimbledon final match while Bartoli won their last encounter in Stanford in 2009. In the ultimate session, Kim Clijsters clashes with Justine Henin. Earlier in the year, they played in the finals in Brisbane. Clijsters defeated Henin in three sets in what she stated was “ one of . . . most exciting matches I think that I’ve played [in] my career . . . we had a great time out there”. 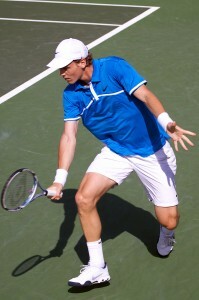 In the initial male quarterfinal, Tomas Berdych faces Fernando Verdasco. After his amazing triumph over Roger Federer, Berdych attempts to at least equal his best result in Miami, he reached the semifinals in 2008. Berdych has 5-3 record against Verdasco. They’ve split their last two meetings. Mikhail Youzhny and Robin Soderling battle it out for the ultimate semifinal berth. Soderling has been victorious their last three out of four matches. In Rotterdam this year, Soderling beat Youzhny. Soderling was well on his way to securing the trophy before the Russian retired with a hamstring problem. In addition, there’s a sprinkling of doubles as Nicolas Almagro and Tommy Robredo square off against Lukas Dlouhy and Leander Paes for a spot in the finals. Arnaud Clement and Jo-Wilfried Tsonga meet Mahesh Bhupathi and Max Mirnyi in the quarterfinals. Last year, Mirnyi won the title with partner Andy Ram. Following a complicated initial match at the Sony Ericsson Open, Roger Federer was again rattled in his third round match. The world number one was seriously pressed by Florent Serra. Still, Federer came away unscathed with a 7-6,7-6 win. Subsequent to neither competitor having issues on serve, Serra had a double fault on game point. Federer took the next two points to break. Then, with a love service game, Federer consolidated for a 5-2 lead. However, as Federer served for the first set at 5-3, he made two costly errors allowing Serra two chances to break. With a forehand down the line return winner, Serra put the first set back on serve. Still, Federer arrived at double set point on Serra’s service. But, the Frenchman did not cave in. With the two men holding at love the next two games, a tiebreaker was initiated. With Federer’s backhand down the line pass landing out of bounds, Serra opened with a mini-break. Then, with a forehand down the line winner of his own and with Serra flubbing an overhead, Federer got a mini-break for 2-1. Federer went on to comfortably carry the breaker. In the second set, by enticing errors from Serra, Federer obtained a double break lead for 4-1. Yet, Serra climbed back. With a backhand overhead winner and a forehand down the line winner, Serra decreased the deficit to 4-2. Then, Serra survived double break point to stay in touch at 3-4. With Federer serving for the match at 5-4, a double fault gave Serra double break point. The Frenchman converted with a forehand up the line winner. Eventually, a second tiebreaker was called upon. Again, after Serra got the early mini-break, Federer rebounded to easily capture the second set. Q. Do you have a preference. . . A match like this [where] you are tested . . . as opposed to having a quick match in the earlier rounds? FEDERER: Well, I mean, most important is to come through the rounds, you know. So I don’t have a preference how it’s done. I always like to come out with confidence, that’s for sure. So it’s nice . . . having won two breakers, because that doesn’t happen every match you play. Sure, I still have to tidy up my game a bit, you know, having had one break up in the first and two breaks up in the second, it’s normally something that doesn’t get away from me. But I thought he came up with some good stuff, and that made it difficult for me, you know, to close it out. That’s why I’m happy to still be through. FEDERER: Well. . . I didn’t have the feeling he was playing the score too much. He was just playing his style, which is aggressive, you know, taking chances. Sometimes missing by many feet. Sometimes, you know, hitting it right in the corners. So I knew that was going to happen kind of thing, but it’s still impressive to see when it does happen against you. You know, that he hits the spots three, four, five, six points in a row, and there’s not much you can do sometimes. I wish I would have maybe served better, you know, at the crucial stages of the match, which I wasn’t able to do. But then he took advantage of that and was able to come up with some amazing stuff. Then you can only hope that, you know, he’s going to cool off again and that . . . you’re going to get your act together so you don’t allow him maybe to play that way. In the third round at the Sony Ericsson Open, Rafael Nadal was severely tested by David Nalbandian. Still, Nadal booked his passage into the round of 16 with a 6-7,6-2,6-2 victory. Andy Roddick breezed through, beating Sergiy Stakhovsky 6-2,6-1 to advance. After Nadal secured the early break at 2-1, Nalbandian knotted the first set at 3 when Nadal double faulted on break point. From that point on, these two guarded serve. In the tiebreaker, Nadal dumped a backhand into the net to give Nalbandian a 2-1 mini-break lead. Later, Nadal leveled things at 4 all. Nalbandian erased a set point by Nadal, then, on his third set point captured the set when Nadal missed a forehand up the line. Although Nadal began the second set with a couple of errors, he held serve. After wiping out a break point by Nalbandian, Nadal converted on a break point courtesy of his rival’s miscue. With a love game, Nadal consolidated for 5-2. Subsequently, the next game, Nadal broke a second time to close out the set. After a love hold, Nalbandian faced break point his second time out in third set. Nadal went on to grab the break for 3-1. Again, with a love hold, Nadal moved ahead 4-1. Following an easy game for 2-4, Nalbandian tried to make a charge, but failed. Nadal extended his lead to 5-2. Then, at triple break/match point, with a forehand up the line winner, Nadal finished off the match. Next up for Nadal is fellow Spaniard David Ferrer. 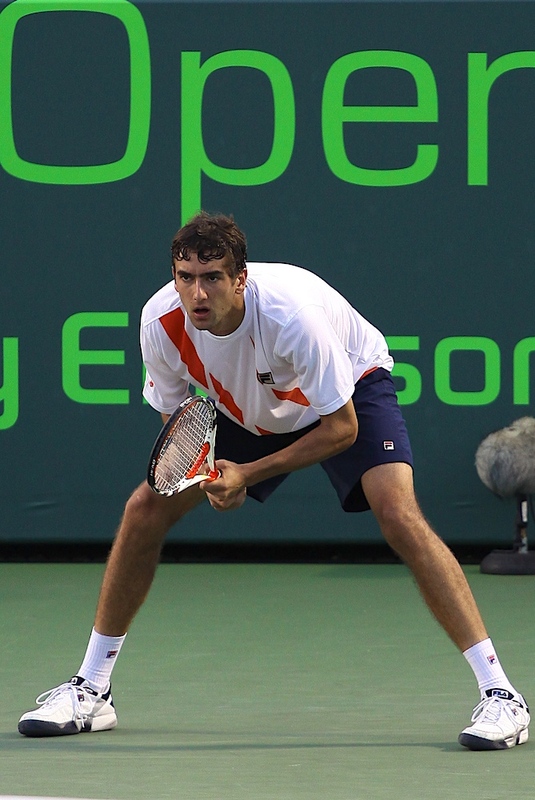 The 15th seed defeated Ivo Karlovic 7-6,6-3. After his smooth entrance into the round of 16, Roddick has another potential easy adversary in Benjamin Becker. Becker prevailed over 18th seed Tommy Robredo 1-6,6-4,7-6. After his glorious victory over Novak Djokovic, Oliver Rochus was brought down to earth by Thomaz Bellucci. Bellucci stopped Rochus, winning 6-3,6-4. 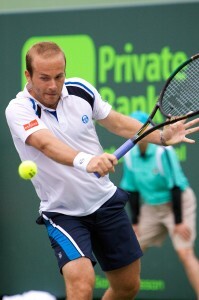 In the succeeding round, Bellluci battles Nicolas Almagro. Almagro fought off Jeremy Chardy 6-2,6-7,6-3. Juan Carlos Ferrero downed American John Isner 6-2,3-6,6-3. The upcoming challenge for Ferrero is Jo-Wilfried Tsonga. The Frenchman ousted Phillip Kohlschreiber in straight sets 6-2,7-5. The men wrap up their third round at the 2010 Sony Ericsson Open today while fourth round action commences for the women. Mardy Fish tries to avoid the lull that postdates a triumph over a player of Andy Murray’s caliber. In the first match of the day, Fish confronts Feliciano Lopez. Their three prior meetings, Lopez won twice on hardcourt while Fish on grass. Afterwards, Roger Federer takes on veteran Florent Serra for the first time. Following is Venus Williams and Daniela Hantuchova. Williams will be shooting for 10-0 record versus her opponent. The day session caps off with a jewel of a match, Kim Clijsters against Victoria Azarenka. In Toronto last year, Clijsters was victorious at their maiden encounter. On stadium court, the evening program has Fernando Gonzalez clashing with Juan Monaco. Gonzalez has prevailed at their five preceding rendezvous. The finale is Justine Henin versus Vera Zvonareva. Henin has won all five prior matches, the last one was in Zurich in 2007. Zvonareva is without question a different player. On the grandstand, Svetlana Kuznetsova and Marion Bartoli do battle. Later, Marcos Baghdatis plays Marin Cilic, the inaugural showdown for these players. Two other top seeds in action at that location are Fernando Verdasco and Robin Soderling. The outer courts have plenty of stimulating singles and doubles matches. After fighting her way into the fourth round yesterday, Caroline Wozniacki is back to face talented youngster Anastasia Pavlyuchenkova. Although Wozniacki carried their sole meeting in New Haven last year, with her dealing with a viral illness and Anastasia much improved, it will be a tough task. In addition, Jelena Jankovic tussles with Sam Stosur for the second tournament in a row. Jankovic has a 3-0 record versus Stosur. Top doubles seed Daniel Nestor and Nenad Zimonjic collide with Nicolas Almagro and Tommy Robredo. John Isner and Sam Querrey try to cut down fourth seed Mahesh Bhupathi and Max Mirnyi. With Spain’s best players, Rafael Nadal and Fernando Verdasco, out of commission due to abdominal muscle injuries, the defending Davis Cup champion had to rely on an alternate squad to bat in the semifinals against Israel. Unfortunately for first time semifinalist Israel, the tandem of David Ferrer, Juan Carlos Ferrero, Tommy Robredo and Feliciano Lopez showed no cracks. Spurred on by their home crowd as well as cheerleaders Nadal and Verdasco, the Spaniards gave an A+ performance. As a result, by Saturday, Spain had carried all three rubbers to safely move on to the finals for the second straight year. Although with the clay Israel was at a conspicuous disadvantage, it still put up an admirable fight. On Friday, Ferrer got his team off to a great start with a 6-1,6-4,6-3 victory over Harel Levy. Subsequently, Israel’s best singles offering Dudi Sela battled Juan Carlos Ferrero. Despite Sela’s valiant effort, with a far more competitive rubber than the score reflected, Sela could not keep up with the former French Open champion. Ferrero prevailed 6-4,6-2,6-0. On Saturday, with Spain ahead two matches to none, the 2008 Australian doubles champion and renowned Israeli pair Andy Ram and Jonathan Erlich represented Israel’s best opportunity to keep its remarkable run alive. The Israelis encountered a wall as Robredo & Lopez, who seldom play as a unit, came up victorious 7-6,6-7,6-4,6-2. With neither team able to capitalize on break point chances, the first set was captured by Spain in a tiebreaker. However, the Israelis quickly reversed that momentum in the second set when Lopez double faulted at 0-40 giving them a 1-0 edge. After Israel consolidated, Robredo saved three break points to maintain a one game deficit at 1-2. With Israel serving for the set at 4-5, Erlich committed a myriad of volley errors which allowed Spain to get back on serve. Following Robredo’s love service game for 6-5, Israel up 40-15 needed Ram’s sensational volleying skills to efface a break point and eventually get into a tiebreaker. Shortly after, a backhand volley error by Erlich permitted the Spaniards to build a 4-1 lead. Yet, this resilient Israeli pair saved five set points and equalized the match when Robredo’s forehand volley sailed long. In the third set, Spain converted triple break point, then broke Israel a second time for 3-0 with some spectacular forehands by Robredo. Although Erlich and Ram closed the gap slightly by breaking, the insurance break was just the cushion the Spaniard required to claim the set. Only weeks removed from right elbow surgery, Erlich couldn’t contend with the blows from the Spanish side. Serving at 1 all in the fourth, a low backhand return by Lopez forced Erlich to volley up resulting in break point. Furthermore, at this critical stage, pain in the elbow caused Erlich to request an injury time out. Soon, back at service line, Erlich surrendered his serve. After consolidating, the Spaniards broke again to extend their lead to 4-1. A few games later, at love, Lopez punched his nation’s passage into the finals. Today, as ordained by the rules, the remaining rubbers took place. In the initial one, Ferrer defeated Ram 6-3,6-1. Israel avoided a shutout as Levy carried the second match 7-5, 6-2 over Lopez. Despite this outcome, the Israelis will look back on 2009 with fondness and great pride. Prior to being derailed by Spain, Israel registered victories over powerhouses Sweden and Russia. Spain will battle Czech Republic, the latter makes it’s first appearance in the finals since 1980. At that time, the territory was in one piece and called Czechoslovakia. The Czechs also secured their entry into the final round on Saturday after winning all three rubbers. On Friday, Radek Stepanek tranquilized a hostile Croatian crowd, stared down 78 aces and took one minute shy of 6 hours before edging out Ivo Karlovic 6-7,7-6,7-6,6-7,16-14. On the heel of one of the longest matches in Davis Cup history, Tomas Berdych, not wanting to be outdone by his countryman, took down Marin Cilic 6-3,6-3,3-6,4-6,6-3 after 3hours and 48 minutes. Still with plenty of reserve, Berdych and Stepanek teamed up on Saturday in what must have seemed like a practice session to beat Lovro Zvoko and Cilic 6-1,6-3,6-4. So today’s action featured two dead rubbers. Czech Jan Hajek defeated Roko Karnusic 7-6,6-4. The home audience did not leave empty handed as Zvoko prevailed over Lukas Dlouhy 6-3, 6-4. The finals will be decided in December with Spain hosting the Czechs Republic. Although both teams performed well on clay this weekend, the Spaniards with the best clay players around, even with Nadal sidelined, will be hard to be. Therefore, it will take a formidable performance by the Czechs to prevent Spain from capturing it’s fourth cup this decade.